I’ve recently taken on a new role as Klipfolio’s Chief Innovation Officer. It’s an exciting change for me, and it’s allowing me to spend some time thinking about – and researching – the whole concept of innovation. It’s a fascinating area, and I’ve learned two big lessons so far. The first is that innovation is hugely important. Companies quite literally live and die by their ability to innovate. The second is that most companies equate innovation with mad scientists wearing lab coats. They don’t understand the process, and as a result aren’t deliberate about being innovative. What I want to do in this post is to share what I’ve learned during the process of moving into my new role, and in particular I want to spell out how a company can make innovation a part of its culture. There are plenty of definitions of innovation, both for tech companies and for businesses in general. I like the simple approach taken by Bill Aulet, an MIT Professor and Managing Director at the Martin Trust Center for MIT Entrepreneurship. In this YouTube video, he explains that an innovation, in the business sense, is an invention that generates value – or as he puts it, Innovation = Invention X Commercialization. In their definition, the Conference Board adds that most companies adopt innovations created by others rather than create something wholly new. That is an important distinction, because it widens the scope of innovation. An innovation that is new to your industry can be just as effective as a brand-new idea. All the definitions point to something that I think is important: Innovation is not about some mad scientist yelling “Eureka!” in a lab somewhere; innovation is a deliberate process that is the result of thought, planning, and effort throughout an entire company. It’s a collective and collaborative effort, not the purview of a single person or division. Finally, it bears mentioning that innovation is not limited to science or business. It can happen in any field. But from a strict business sense, an innovation has to be something you can make money with. You’d think that companies would spend time thinking about how they can innovate. But the fact is, most don’t. Most get too caught up in running their business on a day-to-day basis to think about the future. Or they spend time and effort looking to improve existing products or processes instead of truly innovating. There’s a danger in that approach. Not innovating threatens the survivability of any company. Think of Kodak, or Xerox, or Blockbuster. They were big companies in their day, but they did not move with the times. So, companies need to look to the future – they need to anticipate trends and see how they can take advantage of them (or work around them). In fact, a company that wants to grow must innovate. Klipfolio has been innovative in fits and spurts. But it usually has been in reaction to a disruption in the market. We innovated to leap-frog, or at minimum, catch up. I’ve come to the conclusion that if we want to grow more predictably, we need to focus much more on innovation – and do it in a structured way. We need to build a culture of innovation at Klipfolio. How do you build a culture of innovation in your company? 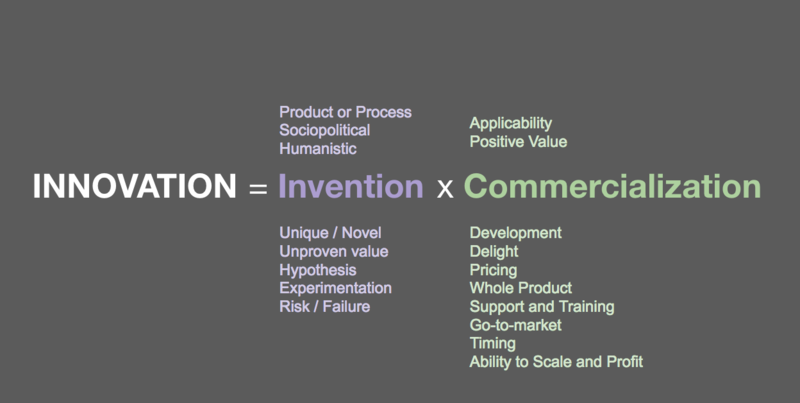 Innovation is not a one-shot deal. It’s not about coming up with one good idea and letting things ride. It’s more about making sure you are always coming up with good ideas, and implementing them. It’s about anticipating trends, and linking innovation to survivability. And the only way to do that is to build a culture of innovation into your company. Innovation is everyone’s job. That is not only necessary for survival, but also good for employee morale. Who wants to work for a company that’s not innovative? The mission statement cannot be product-centric; products and markets evolve, and your mission statement must transcend that. If your mission is broad – to ‘rid the world of cancer,’ for example – you could end up working all sorts of promising areas, shifting focus as circumstances change. You could create medicines, develop innovative surgical techniques, or maybe even develop lifestyle techniques that prevent cancer in the first place. But if your mission statement focuses on something too specific, for example ‘develop better drugs to treat cancer,’ you may deny yourself the ability to shift your focus. There is a long list of companies that failed to adapt to change by remaining too closely focused on a product or service because their mission statement was not broad enough. But if you can create a broad mission statement, you're off to the races. To be truly innovative, companies (and the individuals within them) have to pay attention to what is happening in the world around them. That includes being able to observe mega-trends within society and the world as a whole, but also changes happening within their own industry and among their customers. For example, what hacks are your customers (or your employees) using to get around certain problems? Be aware also of things happening in other industries and consider how they might be applied to yours. Look also for the unexpected. Percy Spencer was an American engineer working with radar in the 1940s. He noticed that microwaves from a radar set he was working on melted a chocolate bar he had in his pocket. He wondered whether microwaves could be used to cook food and soon began experimenting with popcorn and eggs. From that observation (and his subsequent experiments) the microwave oven was born. Spencer was not the first person to notice that microwaves acted on food, but he was the first to follow through with experiments. The next step in the process is turning observations into ideas for innovation – as Percy Spencer did. This is where a company really has to be deliberate, for example by setting up ideation or blue-sky days where you ask ‘what if’ questions and consider realistic (or at least possible) future outcomes – something called speculative design. Don’t be afraid to get creative when speculating about where innovative ideas might lead in the future. Stay within the bounds of reality – no unicorns or flying elephants – but push the envelope where you can. There’s a really cool exercise Airbnb does where they ask people to imagine an experience in an Airbnb accommodation, and ask them to describe what a one-star experience would look like, then a two-star, and all the way to an 11-star experience. Believe it or not, this is the hard part. Because people are often reluctant to adopt new and different ideas or ways of doing things. Think of Crossing the Chasm, the landmark book on marketing high-tech products in the start-up phase. It explains that new ideas are embraced by only a small percentage of people. (About 16% of the market is made up of innovators and early adopters.) It says there is a chasm that must be crossed before an innovation reaches the rest of the market. Those who aren’t innovators or early adopters need to be convinced. Even among the employees of a tech company, there’s a chasm to be crossed before an idea is widely embraced – especially if it’s a disruptive idea. What every company needs is a way to push good ideas forward. If you present an idea and everyone says no, then the idea is probably not a good one. If everybody says yes, then the idea is probably not innovative enough. What you want is what I’ve heard described as a ‘squirmy no,’ where people don’t necessarily agree, but it’s not an immediate no. If you get a squirmy no, you are probably on the right track. Another problem with getting innovative ideas adopted is that there’s a measure of risk involved – and some people (think venture capitalists and investors) are going to be assessing how much risk they face if your ideas get implemented. The bigger the risk or disruption, the bigger the upside needs to be. Innovative ideas, ultimately, are far too easy to kill. They need to be nurtured and protected. It takes courage. It starts with a strong mission and a desire to choose the future. It’s about understanding the risk and opportunity and pushing past most of the naysayers. Watch this space for updates as I work to make innovation a part of everything Klipfolio does.